I love to write about art installations that involve music and light together. I am a composer/musician/sound designer as much as I am a lighting designer (although being a lighting designer often doesn’t allow for playing much music sometimes), and two things in life that go together so wonderfully are music and light. 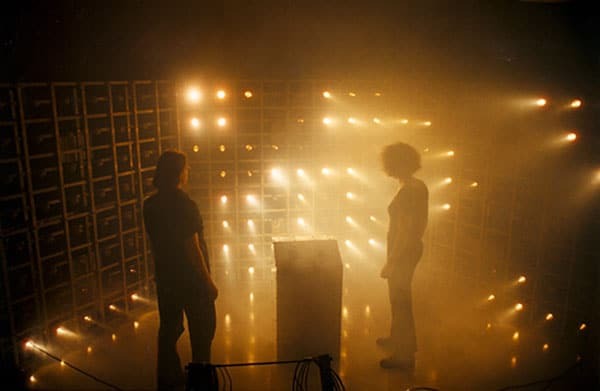 Evil/Live is an installation comprised of a 16-bit matrix of halogen lamps (16 X 16, 256 lamps total) that each have a speaker behind the lamp, and a speaker behind the viewer. Do you remember the algorithm from the 1960’s called The Game of Life? John Conway? Evil/Live is modeled kind of after that. Here’s a flash version of the original-esque. EVIL/LIVE 3 is an expanded version of a previous work created in 1997. EVIL/LIVE is an interactive sound and light installation based on a classical example of self-organization and Artificial Life. It is inspired by “The Game of Life”, a cellular automaton created by John Conway in the late 60’s. 1- A dead cell becomes alive if it has exactly 3 live neighbors. 2- A live cell stays alive only if it has either 2 or 3 live neighbors. EVIL/LIVE 3 aims to create a paradoxal context confronting the single-plane world of a cellular automaton to the 3-dimensional immersive environment surrounding the viewer. 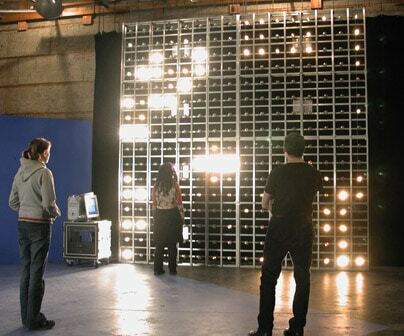 By using fast stroboscopic changes in light and quadraphonic sound effects, it creates an illusion of physical volume. This is a beautiful project – if you’re at the Electrohype Festival in Malmo, Sweden you have to check this out. Bill has quicktime video on his website, here – check that out as well, at the bottom of the page. Previous articleWill Computer Giants Invade the Lighting World? Next articleAre You Kidding? MORE LDI PICS!